Ruthie Phillips, who bills herself as “Australia’s Top Clairvoyant-Medium”, has turned down an offer to be tested for the Australian Skeptics’ $100,000 challenge. 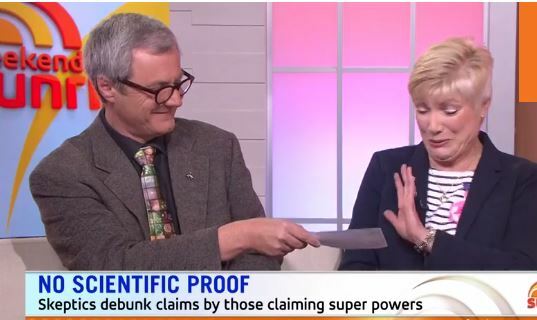 The offer was made to her by Australian Skeptics Inc committee member Richard Saunders on Channel 7’s Weekend Sunrise program on September 9. Saunders is chief investigator with Australian Skeptics Inc, and a judge on Channel 7’s The One psychic challenge series. He had been asked on the Sunrise show to talk about the prize and the fact that no-one had successfully claimed it in 37 years. This followed an article on ABC Online which featured an interview with former Vic Skeptics president Terry Kelly, outlining the history of the challenge and the opportunities it offers anyone with a paranormal ability. The $100,000 challenge is open to anyone who can prove a psychic or paranormal ability under scientific conditions. As a result of the ABC article and Saunders’ TV appearance, the Skeptics have received a stream of applications from psychics, ghost hunters and even an egg-sexer, not to mention other media outlets wanting to know about the challenge. Phillips looked decidedly uncomfortable when Saunders offered her a promotional cheque for $100,000, refusing to touch it. “I personally wouldn’t set myself up for a fall like that because I think there are so many parameters attached to this. “It’s an inexact science,” she said, though the term ‘science’ might be debatable. Phillips does, presumably, charge a fee for her services. One wonders if she offers a money-back guarantee if it is a ‘cloudy day’. Saunders pointed out that, over the 37 years that the Skeptics have been around, they have tested hundreds of people, including many water diviners, as well as psychics, clairvoyants, prophets, and telekineticists. Every test is designed in accordance with the claimant’s skills, and has to be agreed beforehand by both parties to be fair and above-board. The Skeptics’ offer is “still open to Phillips or anyone else in Australia who claims they can talk with the dead or read people’s auras and such like,” Saunders said. It is interesting to note that many in the paranormal game in Australia label themselves as being the best. Apart from Ruthie Phillips’ “Australia’s top clairvoyant-medium”, there is Milton Black – Australia’s leading astrologer and psychic; Mitchell Coombes – Australia’s most trusted psychic medium; Francis Bevan – Australia’s most accurate clairvoyant, psychic & astrologer; Amanda – Australia’s most popular phone psychic; Deb Webber – Australia’s best and most famous psychic medium; and Caterina Ligato – Australia’s foremost psychic healer. Considering their promoted skills, any or all of those are invited to apply for the $100,000 challenge. Oh can we please try to get a live test at Skepticon?? Sceptics refused Deepak Chopra’s $1million challenge to define normal as supposed to paranormal. Regarding Zammit’s challenge – It is impossible to prove a negative (eg prove there isn’t an elephant in the room). It is up to Mr Zammit to prove there is an afterlife, which we have challenged him to do. I don’t know about Chopra’s challenge to sceptics – he has never approached us. But we are happy to discuss the issue. I’m not sure how that qualifies as a “challenge”. Regarding Ruthie Phillips’ refusing the Australian Skeptics challenge, all we ask is that she does what she says she can do under conditions which both sides agree are a fair test. It’s pretty simple really – if you say you can fly without any external assistance, most people would reply, “Show me”. That’s it in a nutshell. If Ms Phillips says it is an “inexact science” and not always 100%, then we assume she doesn’t charge for her services if she is having a bad day, or offers a refund if her prognostications are inexact. – Tim Mendham, Aust Skeptics Inc. So glad you swallowed the bait hook line and sinker-Zammits challenge is word for word identical to the James Randis paranormal challenge.You guys are pseudoskeptics. Rendered irrelevant by the police and court system obtaining hard convitcions where psychics start the police off with clues in very difficult cases. Long lists of convicted murderers are available. The initial evidence from the psychic provided evidence is proven by police investigation peer reviewed forensic methods which withstands rigorous cross examination, convinces juries and remains firm again appeal courts More than 60 repetitions is fairly convincing for normal people. If psychics were truly all frauds James Randi or YOU could have overturned the convictions and set 60 murderers free. So why haven’t you ? Sceptics believe everyone is deluded except themselves. The opposite is true. Don’t bother answering I don’t like listening to Asperger people.I’ll leave you to get those 60 “innocents” out of jail with your masterful reasoning skills overturning 60 verdicts. They are all waiting to be rescued by you. Your trueblue colors are showing. Where are the citations for your claims? If anyone was convicted, they were not convicted based on psychic testimony. Your challenge is meaningless. “…please don’t waste our time. We’re not interested in information from clairvoyants or people who have dreams.” – Detective Chief Inspector Gary Jubelin of the NSW Police, Tuesday 12th September 2017, in regards to the disappearance of William Tyrrell in 2014. “Don’t bother answering I don’t like listening to Asperger people” Haha wow mate.. so you are saying non Asperger people all believe in psychics? so glad that i have Aspergers and not your delusional “Derp i can see da future mon” garbage..
Steve, Randi’s challenge is “to show evidence of any paranormal, supernatural, or occult power under proper observing conditions”. Zammit’s challenge is “to rebut the evidence for the existence of the afterlife”. In what way are these word for word identical? You are grasping at straws. Even psychics make lucky guesses from time to time. That’s one way of keeping the gullible on the hook (line and sinker). Perhaps you could invite this chap, Anthony Grzelka, to the challenge too?